You've picked a great time to visit! Check out my latest course: Reinvent Yourself: Rapid 3-step transformation using creative visualization, the power of your subconscious mind & inspired action. Get started today. Click Here to explore my latest course: Reinvent Yourself! . Live your vision! Are you ready to close the gap between the life you are living now and the one that you sense is possible? "This is the book to give free spirits the nudge toward financial liberation. Free Lark takes a breezy, conversational style and a light-hearted approach to improving your financial health. Backed by research and intriguing hints of personal experience, the book delivers both practical tips for lowering expenses and, more importantly, suggestions for prioritizing your budget to achieve the unbounded life adventure your soul seeks." "Her language is light-hearted and humorous, with some very practical ideas to break free and experience true financial freedom." "The barriers to financial success exist in the walls we build up and achieving success lies in knocking down those walls. 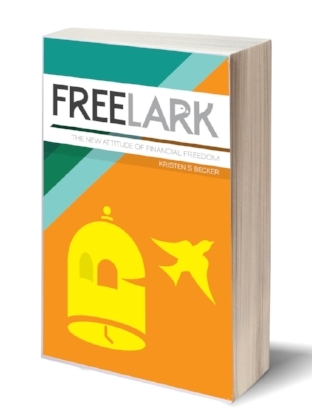 If you’re looking for a pragmatic approach to financial happiness this is the book for you"
If you are looking for true financial freedom, Free Lark is the place to start! Free Lark will not only change your relationship with finances & material possessions but also your relationship with your own life. It’s an unfortunately common occurrence that people today are so worried about achieving financial success that they’re missing out on things that are often the most important— life experiences and loving, authentic relationships.